Hemispheres- 40th Anniversary will be available to fans in four distinct configurations, including the (1) Super Deluxe Edition, (2) two-CD Deluxe Edition, (3) three-LP Deluxe Edition, and (4) Deluxe Digital Edition. The Super Deluxe Edition includes two CDs, one exclusive Blu-ray Audio disc, and three high-quality 180-gram black vinyl LPs. The set encompasses the Abbey Road Studios 2015 remastered edition of the album for the first time on CD, along with previously unreleased and newly restored bonus content consisting of the band’s masterful June 1979 Pinkpop Festival performance in the Netherlands. Unfortunately, the Pinkpop recording engineer failed to capture the first several minutes of “2112,” so an amazing, unreleased performance of the song during the Hemispheres tour from Tucson, Arizona in November 1978 appears here in its place. The third bonus disc is the album newly mixed from the original multitracks in 5.1 surround sound on a Blu-ray Audio disc, along with four bonus videos: three shot in 1978 as promo videos, and one of “La Villa Strangiato,” originally shot at Pinkpop with newly restored stereo audio. 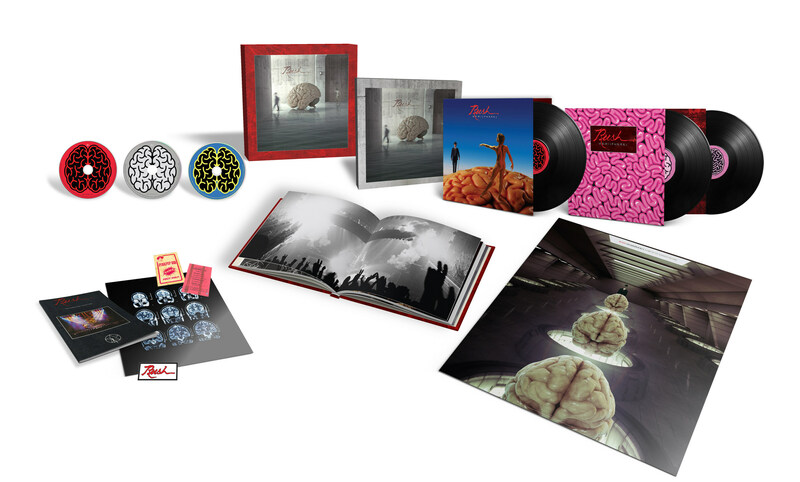 The Super Deluxe Edition of Hemispheres-40th Anniversary will also include several exclusive items, including a 40-page hardcover book with unreleased photos and new artwork by original album designer Hugh Syme; an extensive, 11,000+-word essay by Rob Bowman; The Words & The Pictures, a replica of the band’s rare 1979 UK tour program; a 24×24-inch wall poster of the newly created Syme art; a Pinkpop Festival replica ticket; a Pinkpop Festival replica cloth VIP sticky pass; and a replica 1978 “Rush” Hemispheres iron-on patch. The second configuration of Hemispheres- 40th Anniversary will be released in a two-CD Deluxe Edition digipak that includes the newly remastered Hemispheres album; the Pinkpop Festival performance and “2112” from Arizona; a 28-page booklet with unreleased photos and new artwork by Syme; and an edited, 5,700-word version of Bowman’s aforementioned essay. The third Hemispheres configuration will be offered as an audiophile black vinyl 180-gram three-LP Deluxe Edition featuring the same audio content as the two-CD edition housed in a slipcase with double-gatefold packaging, along with a 24-page booklet with unreleased photos and Syme’s new artwork and the 5,700-word version of Bowman’s liner notes. Gatefold 1 features the original album with Syme’s 40th anniversary artwork, while Gatefold 2 contains the Pinkpop Festival and Arizonabonus content. A 5×5-inch digital download card sticker of Syme’s new 40th anniversary art is also included. The fourth configuration, the Deluxe Digital Edition, is the digital equivalent to the two-CD Deluxe Edition. Rush — bassist/keyboardist/vocalist Geddy Lee, guitarist/vocalist Alex Lifeson, and drummer/lyricist Neil Peart — maintains a large and supremely passionate worldwide fanbase that recognizes and respects the band’s unique, bold, and always exploratory songcraft that combines sterling musicianship, complex compositions, and distinctive lyrical flair. Rush has sold more 25 million albums in the U.S. alone, with worldwide sales estimated at 45 million (and counting), and has been awarded 24 Gold, 14 Platinum, and three Multi-Platinum album distinctions. Rush has received seven Grammy nominations, and was inducted into the Canadian Music Hall of Fame in 1994 and the Rock and Roll Hall of Fame in 2013.